Adam Sneed, (dark shirt, light pants) is with the Historic Department of WASCO, a concrete planning and construction company out of Nashville. 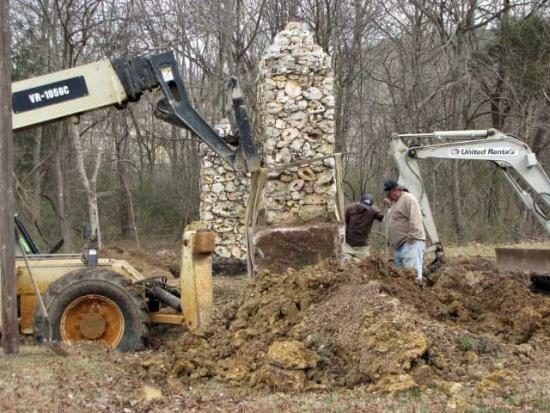 He is overseeing the moving of two pillars of Geodes that have been in place for decades at the entrance to Beaver Dam Subdivision, which was the original name of the farm. The farm has been in the Houston family since before the beginning of the 20th century. These pillars have been inspected by many people from everywhere across the country who were interested about the rock, which contains silica crystals that were gathered from the creeks in Cannon County. Sneed, who has overseen many historical projects, estimates that the pillars weigh 11,400 pounds each. The base of concrete (the foundation) is four feet thick. The straps that are used in conjunction with the heavy equipment will hold 20,00 pounds. Mark Pease of Texas is one of the surviving descendants of the last daughter of Judge Houston. Linda Elizabeth Pease was the bride of Mark Crittenden Pease of Laredo Texas. Her children Mark and daughter Elizabeth M. Pease have control of the Houston property. Linda died just last year, May of 2010. Mark ordered these pillars moved onto the Historic Houston property to preserve them from the construction crews that will be widening Hwy. 70 at the intersection of Houston Lane. Thank goodness someone cares enough to preserve these pillars. Thank you Mark.